Amidst the extraordinarily dense network of pathways in a mammal lung is a common destination. There, any road leads to a cul-de-sac of sorts called the pulmonary acinus. This place looks like a bunch of grapes attached to a stem (acinus means “berry” in Latin). Scientists have struggled to understand more specifically what happens in this microscopic, labyrinthine intersection of alleys and dead ends. 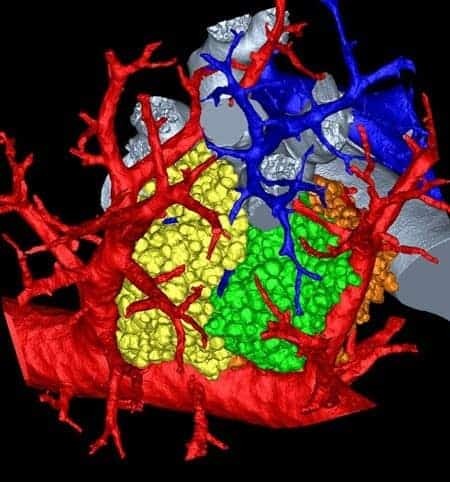 To find out, a research team led by the University of Iowa created the most detailed, three-dimensional rendering of the pulmonary acinus. The computerized model, derived from mice, faithfully mimics each twist and turn in this region, including the length, direction and angles of the respiratory branches that lead to the all-important air sacs called alveoli. “The imaging and image analysis methods described here provide for branch morphometry at the acinar level that has not been available previously,” the researchers write in the paper, published this week in the online early edition of the Proceedings of the National Academy of Sciences. The model is important, because it can help scientists understand where and how lung diseases emerge as well as the role the pulmonary acinus plays in the delivery of drugs, such as those commonly administered with inhalers. As an example, Hoffman said the model could be used to determine how smoking-induced emphysema originates. “It has been hypothesized recently that it begins with the loss of peripheral airways rather than the lung air sacs,” he says, citing ongoing research by James Hogg at the University of British Columbia, who was not involved in this study. It also could shed light and lead to more effective treatment of chronic obstructive pulmonary disease, which causes irreversible damage to the lung, says Dragos Vasilescu, first author on the paper who based his thesis on the research while a graduate student at the UI. For years, the best that lung anatomy pioneers such as study co-corresponding author Ewald Weibel, professor emeritus of anatomy at the University of Bern, could do to study specific areas of a lung was to make measurements in two dimensions or create 3D casts of a lung’s air spaces. The techniques, while giving the earliest insights into a lungs’s makeup and functioning, had their limitations. For one, they did not directly replicate a lung’s structure in real life, and they could not convey how various parts act together as a whole. Yet advances in imaging and computation have enabled researchers to more fully explore how gases and other inhaled substances act in the lung’s furthest recesses. In this study, the team worked with 22 pulmonary acini culled from young and old mice. They then set to “reconstruct” the acini based on micro computed tomography imaging of scanned lungs in mice and extracted from them. The extracted lungs were preserved in a way that kept the anatomy intact—including the tiny air spaces required for successful imaging. From that, the researchers were able to measure an acinus, estimate the number of acini for each mouse lung and even count the alveoli and measure their surface area. The mouse lung, in its structure and function, is remarkably similar to the human lung. That means researchers can alter the genetics of a mouse and see how those changes affect the peripheral structure of the lung and its performance. Already, the researchers found in the current study that mouse alveoli increase in number long past the two weeks that at least one previous study had indicated. Hoffman adds that a separate study is needed to determine whether humans, too, increase the number of air sacs past a certain, predetermined age. The researchers next aim to use the model to more fully understand how gases interact with the bloodstream within the acini and the alveoli. “Our imaging and image-analysis methodologies enable new ways to investigate the lung’s structure and can now be used to further investigate the normal healthy-lung anatomy in humans and be used to visualize and assess the pathological changes in animal models of specific structural diseases,” says Vasilescu, who is a postdoctoral researchfellow at the University of British Columbia. Contributing authors include Zhiyun Gao, post-doctoral researcher in the department of electrical engineering at the UI; Punam Saha, associate professor in the department of electrical engineering at the UI; Leilei Yin, at the University of Illinois; Ge Wang, former radiology professor at the UI and now at Virginia Polytechnic Institute and State University; Beatrice Haefeli-Bleuer, of the University of Bern; and Matthias Ochs, of Hannover Medical School in Germany. The National Institutes of Health, the National Science Foundation and the Swiss National Science Foundation funded the research.